The Romeo y Julieta Mille Fleurs is a great and an accessible petit corona, with 42 ring gauge, 5.1” (129mm) long and comes in a box of 25 cigars. It is fully handmade since 2002, and it packs all the typical Romeo y Julieta flavors (floral characteristics, cedar with hints of sweetness) in a short smoke (about an hour of smoking time). The body of this Mille Fleurs is right in the medium level, and is never too powerful. Perfect for novice smokers or for a morning smoke. 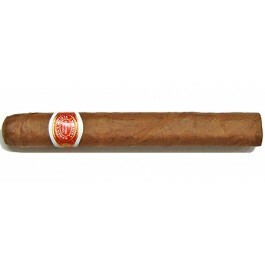 The Romeo y Julieta Mille Fleurs is a great medium Cuban cigar that is perfect for a short and flavorful smoke. •	Complex cigar, with classic Romeo y Julieta floral aromas, mixed with woody, leathery flavors and some sweetness here and there. •	2 or 3 years of aging are recommended to reveal the full potential of this cigar. This Romeo y Julieta is simply an affordable and very tasty every day smoke. The cigar is looking great; it is tightly rolled and packed uniformly from the head to the foot. The wrapper has a consistent medium brown color, a few veins are visible but the seams are perfect and the triple cap is beautiful. On the wrapper, a nice oil sheen of oil is also visible. At cold, the wrapper smells of leather and chocolate. The pre-light draw gives some deep flavors of earth and of leather. There are also hints of floral characteristics. Once cut, the draw is rather firm, but not hampering the smoking experience. Once lit, the Mille Fleurs is generating a lot of velvety smoke, and the finish is short, very fresh and herbal. There are notes of grass and hay on the nose. The cigar is burning well, a little bit wavy at times, only one or two touch-ups are required to correct it. The ash holds on firmly at the foot. When lighting up the cigar, a rich flavor of leather reaches the palate, mixed up with some earthy, grassy and hay notes. Further on, the classic Cuban cedar taste joins the mix, along with some chocolate, while some sweetness also develops, with some hints of caramel, or floral sweetness. There is also just a bit of pepper and spices on the finish. The body is right at the medium level. In the middle third, the dominant flavors are still of leather, wood and bitter chocolate. There are also some notes of coffee and of vanilla. The strength hasn’t changed and it is very pleasant to smoke this Mille Fleurs. In the final third, the leather is still dominant while the cedar and the other flavors from the middle third recede in the background. One noticeable change is the addition of a creamy chocolate note. In summary, it is a great everyday smoke as it is cheap and also ages very well. Exceptionally Pretty Cigars, with Oily, Shiny Wrappers. Smoke is Inundated with Floral Notes throughout a smooth and consistent Medium to Mild Vegetal Flavor. An ideal cigar for beginners, or a perfect morning smoke for the experienced. This was from 2015..floral citrus notes with cedar and very smooth. Superb value!! You can smoke immediately but they get better over time with a little patience. One of the nicest Petit Coronas for the money. They can have a tight draw but this will usually open up once cigar heats a little. Flavours are generally woodsy and develop the slight floral notes often spoken of. A few I have had sitting for a couple of years give subtle hints of sweeter vanilla notes during the second third. The last third can get very tasty and make you debate whether to have another. Can be quick and dimension if smoked fast, but really enjoyable if you take it slow and enjoy. Best value around for the money. I love this cigars from long time, I was surprised with them the first time I smoke them... Good tasting cuban cigar, excellent to smoke in the Spring evenings. I just receive two boxes, two years old in excellent condition. Can't believe how good they are and for the price you can't beat it. Very comparable to other Romeo y Julieta just a little smaller, but taste the same.